Advantages: Clear and interesting selection of photographs, informative captions, excellent artwork, helpful technical drawings; all English text; good format and content for modellers. The Spitfire Mk.22 and 24 represented the ultimate development of Supermarines's famous fighter. With a new powerplant, and completely revised fuselage and wing design, these final Spifires held very little in common with their Battle of Britain brethren, but the family resemblence remained. 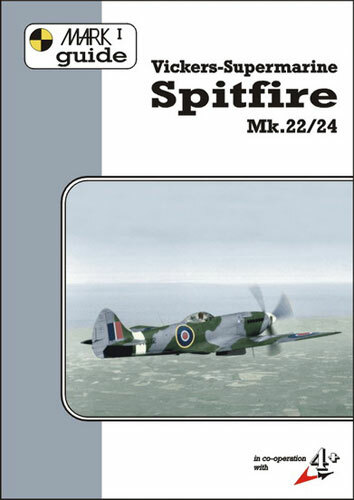 The newest Mark I Guide from 4+ Publications deals with these ultimate Spitfire variants. The book commences with a brief history of the development and deployment of the Mk.22/24, followed by a production list, Squadron allocation and technical data. Next, we are treated to seven pages of contemporary photos of the Spitfire in action, in the field and in storage. All the photos are well reproduced and include helpful captions. Five pages of colour walkaround photos of the Hendon and Duxford Spitfire 24s follow, plus three pages of attractive colour profiles. A number of scrap drawings and four-views are included amongst these pages. The rear cover provides another six profiles of Spitfires in RAF and foreign service. One page of text describing colours and markings prefaces nine pages of detail photos and technical drawings covering many interesting aspects for modellers, including gun bulges, pitot tube, rudder, cockpit (in some detail), wheels, whell wells, those deep radiator housings, exhausts, spinner, propeller, air intake, weapons, ordnance and more. The inside rear cover describes external store variants and their locations. The Mark I book on the Spitfire Mk.22/24 is a concise guide to this ultimate Supermarine propeller fighter. The combination of contemporary photos, walkaround images, scrap drawings, profiles and technical information will be ideal for modellers building a late Spitfire in any scale.